The Kira Institute has spawned several projects that have taken on a life of their own. Art exhibitions, and their associated facilities, and just two such examples. 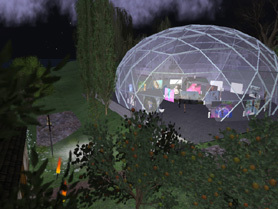 A prototype museum existed on Kira land in Second Life in February 2009 but its buildings were clearly a limitation to easy display and viewing. 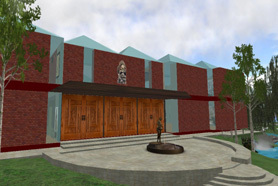 Later that year, Adams Dubrovna commissioned a specially designed museum building on virtual land shared with the Play as Being project, and this opened with its first exhibition in December 2009. Since then there has been a steady progression of exhibitions, often investigating how sacred art has made its transition to virtual worlds. In addition, there are several permanent display in the museum focusing on the art of several religions. The museum has its own website. The Art History workshop often parallels exhibits at the museum. In the spring of 2010, Bleu Oleander initiated the "Art as Being" exhibitions. Participants, 'guardians' with the Play as Being project, were invited to create their own original artworks to express a particular aspect of their experience with Play as Being. The event proved massively popular, and a series of exhibitions followed at regular intervals. Originally, exhibits were placed on the village square - an open area of the Play as Being virtual village in Second Life. After the first exhibition, a bespoke exhibition space was created in the form of a geodesic dome with two display floors. The first exhibition was sculptures only. Many later exhibitions were snapshots from within Second Life only, broadening the range of participants. The exhibition coinciding with the third anniversary of Play as Being was a mixture of both forms.